This article is currently being updated by our staff. Before merging data files, the files should be organized into one folder or a system of subfolders on the hard drive. The organization of files will depend on the needs of the particular experiment. For example, data files for a single experiment may be placed in one folder (e.g., Figure 1), or may be separated into subfolders according to some grouping (e.g., condition), as in Figure 2 below. E-Merge offers two merge operation options: Standard and Recursive. The Standard merge operation (demonstrated in the E-Prime Getting Started Guide) merges data files from a single folder into a target file. This is the most common type of merge operation. The Recursive Merge operation merges data files existing in separate subfolders into a target file. 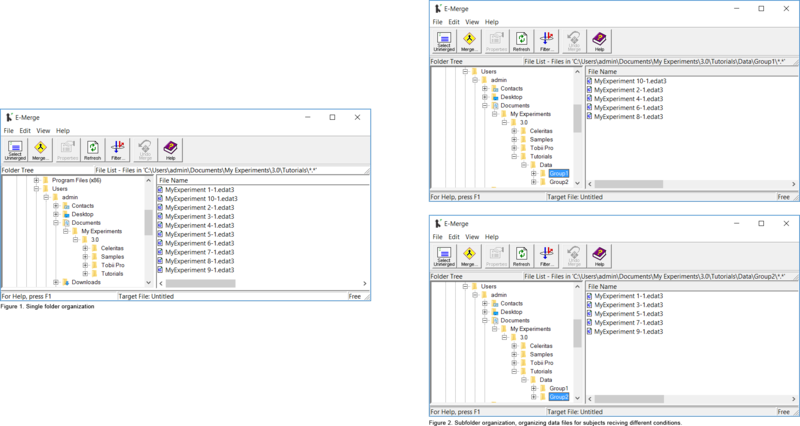 The Recursive Merge operation permits the merging of files located in multiple subfolders using a single merge operation, rather than requiring multiple Standard merge operations. 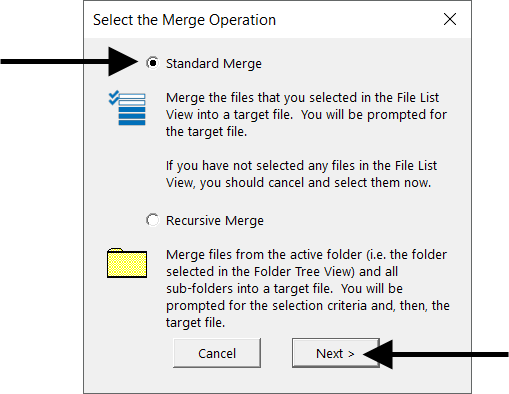 To merge data files in E-Merge using the Standard merge operation, open the data folder in the Folder Tree, select the files to merge in the File List view, and click the Merge button to merge. NOTE: The images used throughout this example reflect operations upon data files included with the E-Prime 3.0 installation. With the default installation, these files exist in the …\My Experiments\Tutorials\Data folder. Within E-Merge, click on the folder containing the data files in the Folder Tree. When the folder is selected, the files in that folder will be displayed in the File List. Once the data files within a folder are displayed, select the specific data files to merge. To select all data files that have never been merged, click the Select Unmerged tool button in the toolbar. To select all files, use the Select All command from the Edit menu. The Select All command selects all E-Prime 3.0 data files (.edat3 and .emrg3) regardless of their merge status (i.e., never merged or previously merged). While all files are highlighted, individual files may be deselected by holding down the Ctrl key and clicking the name of the file with the left mouse button. Files in the list may be individually selected by clicking the file name with the left mouse button. A group of non-contiguous files may be selected by holding down the Ctrl key while selecting the files. A consecutive range of files may be selected by clicking the first file in the range and, while holding down the Shift key, clicking the last file in the range. The display of files in the File List view may be limited using a filter. To display only E-Prime 3.0 .edat3 files in the list, click the Filter button to display the Filter dialog. In the dropdown list, select the “*.edat3” option and click OK. In a similar manner, the list may be filtered for only E-Prime 3.0 .emrg3 files, or for both E-Prime 3.0 .edat3 and .emrg3 files. Filters may also be specified for E-Prime 1.0 data files (.edat and .emrg) and E-Prime 2.0 data files (.edat2 and .emrg2). The Filter on File Name dialog permits the user to enter a custom filter as well. Filters may contain the wildcard symbol “*”, and multiple filters are supported. When entering multiple filters, separate the filters by a semi-colon (e.g., MyExp*.edat3; MyExp*.emrg3). During a merge operation, data files are merged into the target file in the order in which they appear in the list. By default, data files appear in the File List in alphabetical order by file name. The list may be resorted according to values within a specific column by clicking on the appropriate column header. The first click arranges the column in ascending order. Clicks, thereafter, alternately sort the column in descending or ascending order. For example, to make sure the data is merged into the target file in participant order, click the header for the Participant column until the participant numbers are in ascending order. (Because the file names are sorted based on string order, a file name with participant 10 in it may appear before a file name with participant 2 in it. If you have both single-digit and double-digit participant numbers, you may want to rename the files prior to merging, adding a leading zero to the subject number part of the data file. For example, you may wish to rename the file “MyExperiment–2-1.edat3” to “MyExperiment–02–1.edat3).